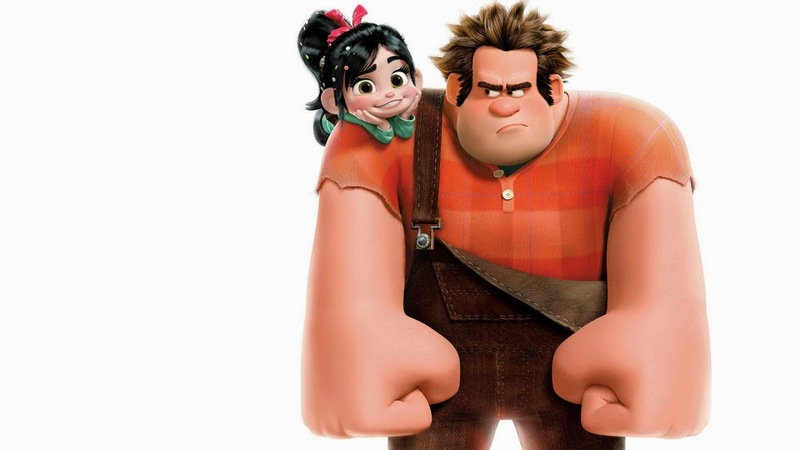 Wreck-It Ralph is a movie by Disney Pixar, released in 2012. It's a really great film for the whole family: there is arcade nostalgia stirred up for the oldies and all the joys of Disney Pixar for the young'uns (or oldies, let's be honest...). I'm not going to lie... It is one of my favourite movies. The story line of the movie is about a sad, "bad guy" Ralph who, after 30 years of being the bad guy, is lonely and ready for change.He leaves his own game, 'Fix it Felix, Jr' in search of a medal - to prove to the others that he is a good guy. This task proves not to be straightforward, of course. He "game jumps" to a game called "Hero's Duty" and gets his medal without too much difficulty, but from there causes havoc and ends up in a game called "Sugar Rush". From there, more adventure begins. Ralph meets a girl called Vanellope Von Schweetz. Vanellope lives in Sugar Rush, a racing game, but she is an outcast. She is not a racer and simply referred to as "the glitch", due to her tendency to, well, glitch. I really enjoy the rest of the plot, but I will skip ahead to the ending where Vanellope does become a racer. However, her glitch doesn't go away - she learns to live with it and use it to her advantage. That's the point I really want to make. I love this movie. I have watched it too many times. I recorded it on TV, and watched it many times and then my friend Luke gifted it to me on iTunes. It is on my iPad and iPhone, and I watch it whenever I want. I enjoy watching it whenever I feel sad, down, nervous or any general negative feeling. The above is a picture (an old one) of my AAC. I use PogoBoards, and will talk more about it at a later date. But as you can see, Wreck-It Ralph has the prime position. 1. Vanellope has a disability. People believe that this means she cannot do much and that she will never be a racer, her dream. Her dream is so strong and she makes it. She proves to everyone that she can do it. 3. Ralph is Vanellope's friend, and at first he is a bit confused by her glitch but soon after, he doesn't care. He sees her as a person - as much more than a glitch. I often tell my friends that they are Ralph, and I am Vanellope. I have some of the best friends. I have one friend who does transfers with me the best, one friend who can position me when I am sitting the best and one friend who cooks the best food. I have the best friends. All of them are Wreck-It Ralph. 4. I like Vanellope's style. I want to be able to pull that off. You can always find parallels to disability in a lot of things - in books, in movies, in almost anything. People have been talking about seeing it in the song "Let it Go" in Frozen (I see other parallels for that, for my own personal experience). But this is what I see in Wreck-It Ralph. If you haven't seen Wreck-It Ralph, you should. And Wicked, the Broadway play. That's another one. But that's a post for another day, too. It does sound like a cute movie with an important message!